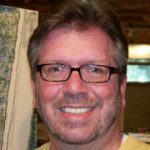 Landscapes rendered in pastel are his passion, but as the exhibitions director of the Rehoboth Beach Art League until Spring 2012, Nicholas Serratore spent the bulk of his time tending to other artists and their work. His day job kept him tethered to the arts, but that’s not necessarily enough for such a creative type. He will continue to help out at the Art League part time over the summer, but once fall arrives, he will be a full-time artist, working out of his home’s basement studio, a cinderblock-encased bastion that, though messy, offers him plenty of room to spread out. After he graduated from art school, Serratore was sucked into the job search and didn’t paint for several years. But a move to Lewes in the mid-1990s jump-started his artistic passions. He had been schooled in many mediums, but he found himself fascinated with pastels. He decided he’d work strictly with them until he felt he’d mastered the method. That’s not to say he doesn’t explore other mediums during spare moments. He’s been working on abstract art, for example, with acrylics and collages. 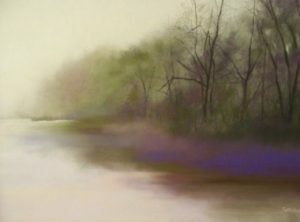 His pastels, meanwhile, often are ethereal, softly focused, even foggy. A colleague once described them as “atmospheric.” That fits Serratore’s intention — with each work, he aims to capture some sort of feeling, and he finds that such hazy elements, such abstract quality, help evoke viewers’ emotions. “I always try to give it a hint of something mellow,” he says. 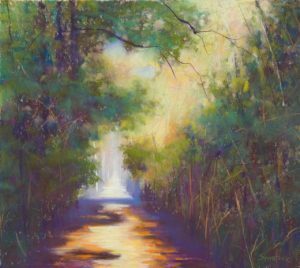 The very nature of pastels, he says, lends a soft quality to scenes. And so his landscapes, dreamlike and varying in points of perspective, draw as much from his own experience as from the photographs he takes at each locale. The Division’s grant has allowed him to be more creative with the presentation of his pastels — he’s invested, for instance, in frames. His show, which he plans to call “Walk with Me,” opens Dec. 7 in the Mezzanine Gallery at the Carvel State Office Building.